We are so excited to be a part of a training marriage ministers, counselors and marriage champions, just like you, across Texas this Spring. Come join us and learn how to work with couples. You will be taught how to teach our Life Together Forever couples curriculum for pre-marital and married couples. If you complete the training, you will also receive certification in the curriculum. The curriculum is approved in the Twogether In Texas program and you will be allowed to give away certificates for free marriage licenses after trained. Attendees will also receive a free copy of our Church Small Group Curriculum called, “The Secret To Lifetime Love” as well as receive a copy of our book, “Four Minutes to Revolutionize Your Relationship”. 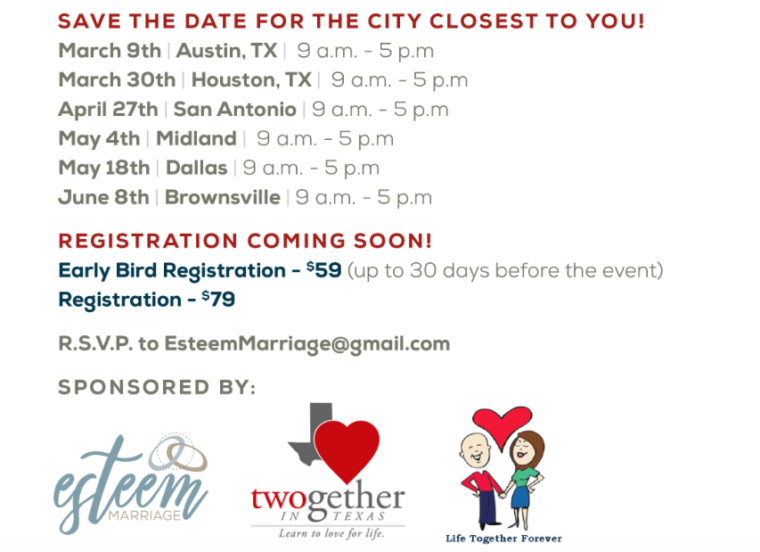 To learn more and to register, contact EsteemMarriage@gmail.com or go to Esteem Marriage.